Abrupt withdrawal of inhaled corticosteroids does not result in spirometric deterioration in chronic obstructive pulmonary disease: Effect of phenotyping? Background and Objective: Some studies show a decline of FEV 1 only one month after withdrawal of inhaled corticosteroids (ICS), while others show no decline. We speculate that the presence of an asthma phenotype in the Chronic Obstructive Pulmonary Disease (COPD) population, and that its exclusion may result in no spirometric deterioration. Methods: We performed a prospective clinical observation study on 32 patients who fulfilled the Global Initiative for Chronic Obstructive lung disease definition of COPD (Grade II-IV). They were divided into two phenotypic groups. 1. Irreversible asthma (A and B) (n = 13): A. Asthma: Bronchial biopsy shows diffuse thickening of basement membrane (≥ 6.6 ΅m). B. Airflow limitation (AFL) likely to be asthma: KCO > 80% predicted if the patient refused biopsy. 2. COPD (A and B) (n = 19): A. COPD: hypercapneic respiratory failure with raised bicarbonate, panlobular emphysema with multiple bullas, or bronchial biopsy showing squamous metaplasia and epithelial/subepithelial inflammation without thickening of the basement membrane. B. AFL likely to be COPD: KCO < 80% predicted. Results: The asthma phenotype was significantly younger, had a strong association with hypertrophy of nasal turbinates, and registered a significant improvement of FEV 1 (350 ml) vs a decline of - 26.5 ml in the COPD phenotype following therapy with budesonide/formoterol for one year. Withdrawal of budesonide for 4 weeks in the COPD phenotype resulted in FEV 1 + 1.33% (SD ΁ 5.71) and FVC + 1.24% (SD ΁ 5.32); a change of <12% in all patients. Conclusions: We recorded no spirometric deterioration after exclusion of the asthma phenotype from a COPD group. In our practice, ICS are routinely withdrawn in the COPD phenotype in the spring and summer months when the risk of exacerbations is at its lowest. We decided to study the effect of the withdrawal on spirometry. This is a prospective clinical observation study conducted between April and May 2009 at King Khalid University Hospital, King Saud University, Riyadh, Saudi Arabia, and approved by the King Saud University's Internal Review Board for ethics approval. All patients attending the Respiratory Medicine clinics in the six months prior to the study were screened. Subjects were smokers (≥ 10 pack/year) with airflow limitation (AFL) (FEV 1 < 80% predicted, FEV 1 /FVC < 70%) that was persistent despite budesonide/formoterol treatment (320 μcg budesonide/9 μcg formoterol bid for at least 3 weeks). Patients in this group who fulfilled the Global Initiative for Chronic Obstructive lung disease diagnostic criteria for COPD were labeled as undiagnosed AFL, and further subdivided into irreversible asthma or COPD phenotypes. Irreversible asthma was diagnosed if the bronchial biopsy showed uniform thickening of the basement membrane of 6.6 μm or more. The diagnosis was registered as AFL likely to be irreversible asthma, in any patient who refused biopsy and had normal diffusing capacity for carbon monoxide coefficient (KCO3 80 % predicted). The data were analyzed using the statistical Software Package (SPSS pc + version 13.0; SPSS Inc, USA). The Mann-Whitney U-Test was used to compare the median values of skewed continuous variables. 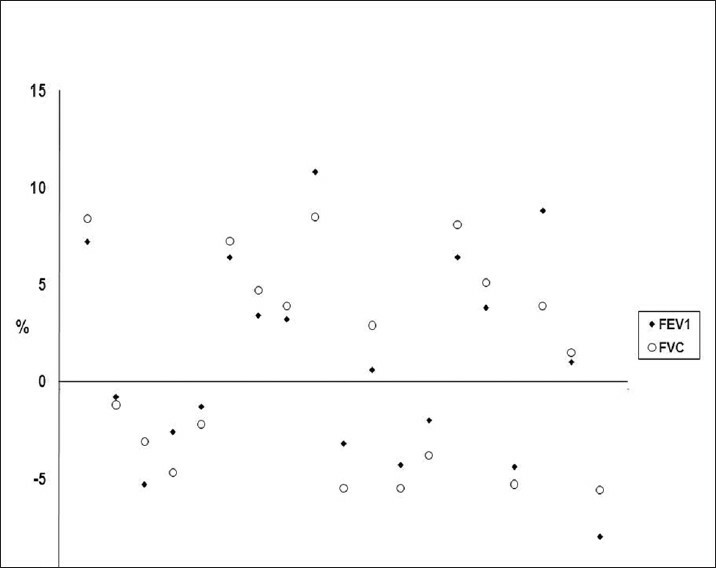 The Chi-square and Fisher's exact test were used to observe an association between categorical study and outcome variables. A P value < 0.05 was considered statistically significant. There were a total of 32 patients with undiagnosed AFL. Of these, 13 were of the irreversible asthma phenotype: eight with asthma and five with AFL likely to be asthma. The remaining 19 were of the COPD phenotype based on the following: six had panlobular emphysema with bullas, four patients had hypercapneic respiratory failure, one patient had both, and a positive bronchial biopsy in five. Three patients had AFL likely to be COPD. All were male patients. [Table 1] gives the characteristics of both phenotypes and shows significant differences. Patients in the irreversible asthma phenotype were younger, had earlier onset of wheeze and dyspnea (45 vs 59 years), and were more likely to suffer from allergic rhinitis and hypertrophy of nasal turbinates. They also achieved a mean rise of FEV1 of 350 ml with budesonide/formoterol, vs a decline of -26.5 ml in the COPD phenotype. Four weeks after budesonide withdrawal in the COPD phenotype group, changes in FEV1 and FVC were 1.33% (±5.71) and 1.24% (±5.32), respectively. The change was <12% and 200 ml in all patients [Figure 1]. In conclusion, in a small population of COPD sufferers, where the irreversible asthma phenotype (+ve bronchial biopsy or normal KCO) was excluded, there was no significant drop of FEV 1 or FVC four weeks after withdrawal of budesonide. The College of Medicine Research Center of King Saud University has offered technical support for the research. 1. Calverley PM, Anderson JA, Celli B, Ferguson GT, Jenkins C, Jones PW, et al. Salmeterol and fluticasone propionate and survival in chronic obstructive pulmonary disease. N Engl J Med 2007;356:775-89. 2. Calverley P, Pauwels R, Vestbo J, Jones P, Pride N, Gulsvik A, et al. Combined salmeterol and fluticasone in the treatment of chronic obstructive pulmonary disease: A randomized controlled trial. Lancet 2003;361:449-56. 3. Burge PS, Calverley PM, Jones PW, Spencer S, Anderson JA, Maslen TK. Randomised, double blind, placebo controlled study of fluticasone propionate in patients with moderate to severe chronic obstructive pulmonary disease: The ISOLDE trial. BMJ 2000;320:1297-303. 4. Kardos P, Wencker M, Glaab T, Vogelmeier C. Impact of salmeterol/fluticasone proprionate versus salmeterol on exacerbations in severe chronic obstructive pulmonary disease. Am J Respir Crit Care Med 2007;175:144-9. 5. Glaab T, Taube C. Effect of inhaled corticosteroids in stable chronic obstructive pulmonary disease. Pulm Pharmacol Ther 2011;24:15-22. 6. Rodrigo GJ, Castro-Rodriguez JA, Plaza V. Safety and efficacy of combined long-acting beta-agonists and inhaled corticosteroids vs long-acting beta-agonists monotherapy for stable COPD: A systematic review. Chest 2009;136:1029-38. 7. Barnes PJ. Inhaled corticosteroids in COPD: A controversy. Respiration 2010;80:89-95. 8. Tashkin DP, Rennard SI, Martin P, Ramachandran S, Martin UJ, Silkoff PE, et al. Efficacy and safety of budesonide and formoterol in one pressurized metered-dose inhaler in patients with moderate to very severe chronic obstructive pulmonary disease: Results of a 6-month randomized clinical trial. Drugs 2008;68:1975-2000. 9. Mahler DA, Wire P, Horstman D, Chang CN, Yates J, Fischer T. Effectiveness of fluticasone propionate and salmeterol combination delivered via the Diskus devise in the treatment of chronic obstructive pulmonary disease. Am J Respir Crit Care Med 2002 166:1084-91. 10. Hanania NA, Darken P, Horstman D, Reisner C, Lee B, Davis S, et al. The efficacy and safety of fluticasone propionate (250 µg)/salmeterol (50 µg) combined in the Diskus Inhaler for the treatment of COPD. Chest 2003;124:834-43. 11. Calverley PM, Kuna P, Monsó E, Costantini M, Petruzzelli S, Sergio F. Beclomethasone/formoterol in the management of COPD: A randomized controlled trial. Respir Med 2010;104:1858-68. 12. Wouters EFM, Postma DS, Fokkenst B, Hop WC, Prins J, Kuipers AF, et al. For the COSMIC group. Withdrawal of fluticasone propionate from combined salmeterol/fluticasone treatment in patients with COPD causes immediate and sustained disease deterioration: A randomized controlled trial. Thorax 2005;60:480-7. 13. Global Initiative for chronic obstructive pulmonary disease. Updated 2010. Accessed at www.goldcopd.org on 28 th June 2011. 14. Choudhury AB, Dawson CM, Kilvington HE, Eldridge S, James WY, Wedzicha JA. Withdrawal of inhaled corticosteroids in people with COPD in primary care: A randomized controlled trial. Respir Res 2007;8:93. 15. van der Valk P, Monninkhof E, van der Palen J, Zielhuis G, van Herwaarden C. Effect of discontinuation of inhaled corticosteroids in patients with Chronic Obstructive Pulmonary Disease. The COPE study. Am J Respir Crit Care Med 2002;166:1358-63. 16. O'Brien A, Russo-Magno P, Karki A, Hiranniramol S, Hardin M, Kaszuba M, et al. Effects of withdrawal of inhaled steroids in men with severe irreversible airflow obstruction. Am J Respir Crit Care Med 2001;164:365-71. 17. Chanez P, Vignola AM, O'Shaugnessy T, Enander I, Li D, Jeffery PK, et al. Corticosteroid reversibility in COPD is related to features of asthma. Am J Respir Crit Care Med 1997;155:1529-34. 18. Bellia V, Battaglia S, Catalano F, Scichilone N, Incalzi RA, Imperiale C, et al. Aging and disability affect misdiagnosis of COPD in elderly asthmatics: The SARA study. Chest 2003;123:1066-72. 19. Al-Kassimi FA, Abba AA, Al-Hajjaj MS, Alhamad EH, Raddaoui E, Shaikh SH. Asthma Masquerading as Chronic Obstructive Pulmonary Disease: A Study of Smokers Fulfilling the GOLD definition of Chronic Obstructive Pulmonary Disease. Respiration 2011;82:19-27. 20. Ten Brinke A. Risk factors associated with irreversible airflow limitation in asthma. Curr Opin Allergy Clin Immunol 2008;8:63-9. 21. Shaya FT, Dongyi D, Okazawa M, Blanchette CM, Wang J, Mapel DW, et al. Burden of concomitant asthma and COPD in Medicaid population. Chest 2008;134:14-9. 22. Brightling CE, McKenna S, Hargadon B, Birring S, Green R, Siva R, et al. Sputum eosinophilia and the short term response to inhaled mometasone in chronic obstructive pulmonary disease. Thorax 2005;60:193-8. 23. Brightling CE, Monteiro W, Ward R, Parker D, Morgan MD, Wardlow AJ, et al. Sputum eosinophila and short-term response to prednisolone in chronic obstructive pulmonary disease: A randomized controlled trial. Lancet 2000;356:1480-5. 24. Lee JH, Lee YK, Kim EK, Kim TH, Huh JW, Kim WJ, et al. Responses to inhaled long-acting beta-agonist and corticosteroid according to COPD subtype. Respir Med 2010;104:542-9. 25. Fingleton J, Weatherall M, Beasley R. Towards individualized treatment in COPD. Thorax 2011;66:363-4. 26. Shirtcliffe P, Weatherall M, Travers J, Beasley R. The multiple dimensions of airways disease: Targeting treatment to clinical phenotypes. Curr Opin Pulm Med 2011;17:72-8. 27. Fabbri LM, Romagnoli M, Corbetta, Casoni G, Busljetic K, Turato G, et al. Differences in airway inflammation in patients with fixed airflow obstruction due to asthma or chronic obstructive pulmonary disease. Am J Respir Crit Care Med 2003;167:418-24. 28. Al-Kassimi FA, Al-Hajjaj MS, Alhamad EH, Abba AA, Raddaoui E, Shaikh SA. Abrupt withdrawal of inhaled corticosteroids in COPD does not produce spirometric deterioration: Role of phenotyping. Ann Thorac Med 2011;6:174. 29. Han MK, Agusti A, Calverley PM, Celli BR, Criner G, Curtis JL, et al. Chronic obstructive pulmonary disease phenotypes: The future of COPD. Am J Respir Crit Care Med 2010;182:598-604. 30. Fujimoto K, Kitaguchi Y, Kubo K, Honda T. Clinical analysis of chronic obstructive pulmonary disease phenotypes classified using high-resolution computed tomography. Respirology 2006;11:731-40. 31. Soler-Catluña JJ, Cosio B, Izquierdo JL, López-Campos JL, Marin JM, Agüero R, et al. Consensus Document on the mixed asthma-COPD phenotype in COPD. Arch Bronconeumol 2012. [Epub ahead of print]. 32. Caramori G, Fabbri M, Paioli D, Falcone F, Severino C, Felisatti G, et al. Asthma is not a common cause of severe chronic respiratory failure in non-smokers: ALOT study. Monaldi Arch Chest Dis 2005;63:84-7. 33. Szafranski W, Polsce JZ. Long-term domiciliary oxygen therapy (LTOT) in Poland in the years 1986-2005 (in Polish). Pneumonol Alergol Pol 2007;75:331-42. 34. Tsuda Y, Nogochi T, Mochizuki H, Makino F, Nanjo Y, Sawabe M. et al. Patients with mild-to-moderate asthma may develop clinically significant chronic obstructive pulmonary disease. Respirology 2009;14:529-36. 35. Harmanci E, Kebapci M, Metintas M, Ozkan R. High-resolution computed tomography findings are correlated with disease severity in asthma. Respiration 2002;69:420-6. 36. Bourdin A, Serre I, Flamme A, Vic P, Neveu D, Aubas B, et al. Can endobronchial biopsy analysis be recommended to discriminate between asthma and COPD in routine practice? Thorax 2004;59:488-93. 37. Liesker JJ, Ten Hacken NH, Zeinstra-Smith M, Rutgers SR, Postma DS, Timens W. Reticular basement membrane in asthma and COPD: Similar thickness, yet different composition. Int J Chron Obstruct Pulmon Dis 2009;4:127-35. 38. Mitsunobu F, Mifune T, Ashida K, Hosaki Y, Tsugeno H, Okamoto M, et al. Influence of age and disease severity on high resolution CT lung densitometry in asthma. Thorax 2001;56:851-6. 39. Boulet LP, Turcotte H, Hudon C, Carrier G, Maltais F. Clinical, physiological and radiological features of asthma with incomplete reversibility compared with those of COPD. Can Respir J 1998;5:270-7. 40. Chhabra SK. Acute bronchodilator response has limited value in differentiating bronchial asthma from COPD. J Asthma 2005;42:367-72. 41. Barnes PJ. How corticosteroids control inflammation: Quintiles Prize Lecture 2005. Br J Pharmacol 2006;148:245-54. 42. Barnes PJ, Ito K, Adcock IM. Corticosteroid resistance in chronic obstructive pulmonary disease: Inactivation of histone deacetylase. Lancet 2004;363:731-3. 43. Keatings VM, Jatakanon A, Worsdell YM, Barnes PJ. Effects of inhaled and oral glucocorticoids on inflammatory indices in asthma and COPD. Am J Respir Crit Care Med 1997;155:542-8. 44. Culpitt SV, Maziak W, Loukidis S, Nightingale JA, Matthews JL, Barnes PJ. Effect of high dose inhaled steroid on cells, cytokines, and proteases in induced sputum in chronic obstructive pulmonary disease. Am J Respir Crit Care Med 1999;160:1635-9. 45. Loppow D, Schleiss MB, Kanniess F, Taube C, Jörres RA, Magnussen H. In patients with chronic bronchitis a four week trial with inhaled steroids does not attenuate airway inflammation. Respir Med 2001;95:115-21. 46. Gizycki MJ, Hattotuwa KL, Barnes N, Jeffery PK. Effects of fluticasone propionate on inflammatory cells in COPD: An ultrastructural examination of endobronchial biopsy tissue. Thorax 2002;57:799-803. 47. Saha S, Brightling CE. Eosinophilic airway inflammation in COPD. Int J Chron Obstruct Pulmon Dis 2006;1:39-47. 48. El-Kassimi FA. Differentiating asthma and COPD patients (Letter to the editor). Chest 2004;126:653-4; author reply 654-5. Al-Kassimi, F.A. and Alhamad, E.H.